Ten-man FC Halifax Town eased to a 3-0 victory at The Shay over a poor Worcester side, who had two players sent-off. Goals from Kevin Roberts, Josh Wilde and the obligatory effort by Tom Denton completed a near-perfect opening week of the season for The Shaymen, despite Cliff Moyo’s sending-off in the first-half. It took Town 12 games to amass seven points last season - they’ve done in a quarter of the time this campaign. As it turned out, Moyo’s dismissal was barely even a bump in the road as Halifax cruised to the win, with Worcester playing more like the team with 10-men. They had nine by the end though, with veteran forward Lee Hughes lasting only 23 minutes after coming off the bench. Billy Heath, perhaps anticipating Worcester might pack the midfield, started with three central midfielders of his own, including Tuesday night’s hero Jordan Sinnott, who replaced namesake Burrow in Halifax’s only change. Worcester made their intentions clear by fielding one man up front, something The Shaymen might have to get used to from visitors this season, and the game suffered as a result, with the early stages as lacklustre as they had been against Altrincham. But from Town’s first effort on target, they took the lead when Denton won an aerial battle with ex-Halifax defender Graham Hutchison to flick the ball into the path of Roberts, who smashed the ball in from 10 yards. It was Roberts’ first goal for Halifax and his first goal full-stop since scoring for Cambridge at Barrow in April 2012. Worcester had offered little before going behind, and after Roberts’ goal, their response was negligible. It was all going swimmingly well until the 26th minute when Cliff Moyo produced a poor tackle, studs up, on Worcester’s Richard Batchelor which earned the full-back a straight red. Billy Heath’s thoughts on the challenge could perhaps be gleaned from his lack of handshake as Moyo trudged past him towards the tunnel; especially with Halifax in complete control of the contest and Worcester in possession near the halfway line and the touchline, nowhere near Steve Drench’s goal. That necessitated Roberts moving to right-back and Halifax funneling in a 4-4-1 system, meaning Denton was now either flicking balls onto himself or his invisible strike partner. The Town fans felt referee Steven Copeland should have then shown Worcester’s Cieron Keane at least a yellow card for an unnecessary shove on Josh Macdonald which provoked both benches and half the players to gather round the dueling pair, although no further action was taken. To compound an unedifying 30 seconds for the left-back, Keane then took a foul throw. Against the run of play, Denton, now doing the work of two strikers in attack, should have doubled Town’s lead but his deft touch from Roberts’ cross wasn’t strong enough, while Macdonald then mis-hit his shot when put in-behind the Worcester defence; were the hosts really playing with 10 men? A poor tackle by Keane on Macdonald did earn the full-back a booking just before half-time, and cemented his status as public enemy number one among the home supporters. 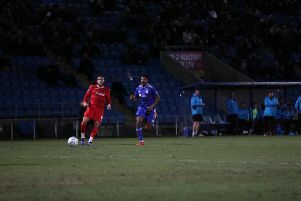 Halifax retained the stronger attacking threat after the interval, with another superb run by Macdonald forcing Joe Fitzpatrick into a desperate body-check to stop him, earning him a booking, before substitute Jake Hibbs, like Denton had in the first-half, didn’t get enough contact on a low cross when well-placed in the area. The seemingly-inevitable second arrived when Worcester’s dawdling just inside their own penalty area was punished as Wilde’s sliding tackle on Junior English not only won the ball but saw it loop over Ethan Ross in the opposition goal. Three points pretty much sealed and not even an hour on the clock. Heath remained a bundle of energetic gestures on the touchline, but it was the Worcester players who needed geeing-up, with the visitors lacking in creativity and incisiveness in attack, even against 10 men for more than an hour. The away side didn’t test Drench until the 70th minute when persistence and strength from substitute Chekaine Steele got him into the penalty area before his shot was saved on the line by the Town keeper. A miserable afternoon for Keane was then concluded when he was given a second-yellow, which was about as inevitable as the result itself. for a late tackle on Hibbs. Somehow, it got worse for Worcester before full-time when substitute Lee Hughes was also dismissed for pushing Danny Hone in the face. Then, it got worse still as Matty Kosylo’s cross was expertly headed back across goal and in by Denton, who is already becoming a permanent fixture on the scoresheet. Halifax: Drench, Moyo, Wilde, Hone, Garner, Macdonald (Kosylo 87), Hotte, Roberts, Sinnott (Hibbs 46), Peniket (Hughes 72), Denton. Subs not used: Nicholson, Burrow. Worcester: Ross, Gallinagh, Keane, Hutchison, Sharpe, Fitzpatrick (Hughes 60), Murphy (Steele 60), English, Bishop (Craig 80), Nelson-Addy, Batchelor. Subs not used: Draper, Jackman.